Muslims around the world are celebrating a British man, who murdered an innocent shopkeeper who they considered an “apostate”, as an Islamist hero. 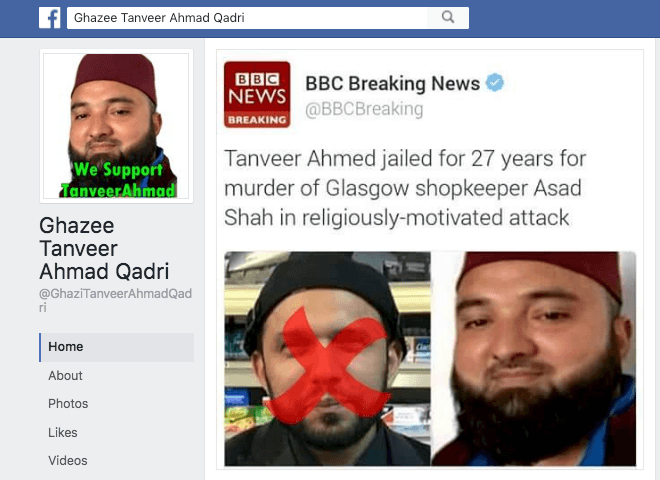 On Tuesday, Tanveer Ahmed was jailed for 27 years after driving more than 200 miles from Bradford to Glasgow to murder Asad Shah – a man who was targeted for “disrespecting Islam” by wishing Christians a happy Easter. Some of Mr. Ahmed’s fans and family members shouted Islamic slogans in court and one supporter outside argued the sentence was not “fair”. Mr. Shah was an Ahmadiyya Muslim – a peaceful sect who are persecuted and classed as apostates in Pakistan. The Muslim Council of Britain – the largest and most influential Muslim group in Britain – was until recently officially affiliated to a group calling for “capital punishment” against the sect on posters in mosques and universities around the UK. Supporters Of Killer Confronted By LBCWatch our reporter put some hard questions to the supporters of murderer Tanveer Ahmed. Now, Breitbart London has discovered numerous social media accounts celebrating Mr. Ahmed alongside his hero Mumtaz Qadri, a fellow religiously motivated murderer from Pakistan. Their faces appear alongside one another on a Facebook page called ST-Mujahid News. A ‘mujahid’ is one who “struggles” for the sake of Allah and Islam – also known as a jihadi. The page uses Hindi, but many of the comments below the image are in English. Sonya Khan wrote, “we proud of both”. Ch Haseeb added: “Great man”. A page titled “We Support Tanveer Ahmad” has nearly 3,000 likes and posts sinister content about Mr. Shah and Ahmadiyya Muslims, which could easily be interpreted as incitement to violence. Another page in Arabic dedicated to the killer has more than 9,000 likes. 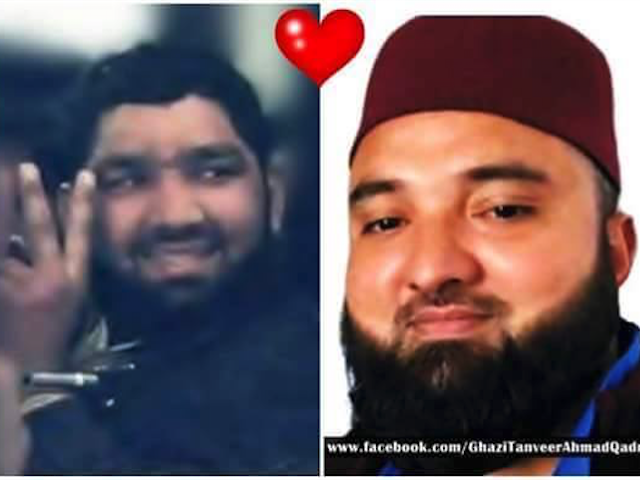 The Glasgow killer Tanveer Ahmed’s idol, Mumtaz Qadri, killed moderate Pakistani politician Salmaan Taseer because he had “insulted Islam” by opposing Pakistan’s blasphemy law. Mr. Ahmed’s brother told the BBC that he used to write letters to Qadri. He even called Qadri’s brother after committing the murder in Glasgow to boast about it. Since being executed for the crime, Mr. Qadri has become a cult figure in Pakistan with hundreds of thousands attending his funeral, including many British Muslims, imams, and clerics. The imam of Glasgow Central Mosque was just one of many to praise him, calling him a “brother” and “true Muslim”. A prominent imam from Bolton flew out to his funeral and a mosque in High Wycombe was accused of “hate preaching” after allegedly praising Mr. Qadri. He also explained that if Muslims continue to venerate killers, more people will inevitably be killed. “To glorify a murderer is not to glorify the individual but to glorify his actions and to call on someone to emulate them. It is essentially a call to action.